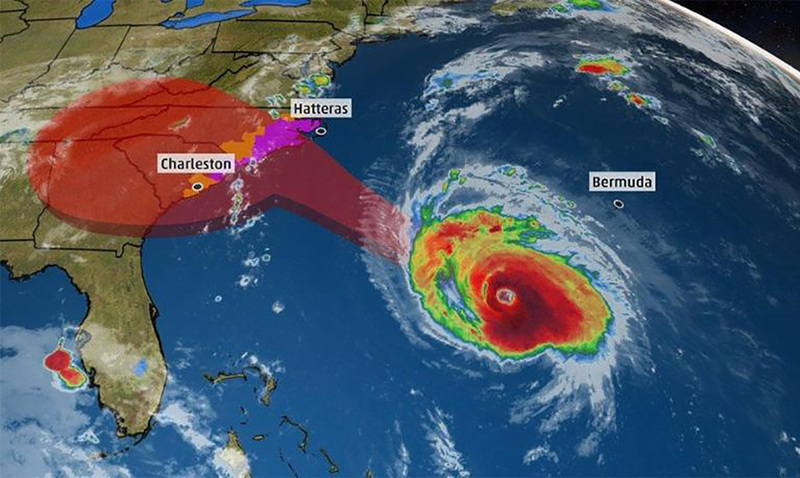 Hurricane Florence is steady making way towards land here in the US along the East Coast and those in the Virginias and Carolinas are making preparations for the worst. This storm is currently a category 4 and according to NHC has reached wind speeds of about 130 mph. It could be the strongest storm to make landfall north of Florida and is predicted to end up being just that. While category 4 hurricanes have hit north of Florida before, but all of them were still below where Florence is supposed to hit. It has also been said that the storm could become category 5 as it gets closer, only time will tell. Landfall is expected by Thursday and will bring with it lots of rain. It will be a threat to anyone in its path. To reach Category 5 status, the storm will have to blow sustained winds above 157 mph (253 km/h). The current intensification is being driven by warm, moist air and a favorable atmosphere, said Joel Cline, a tropical program coordinator at the NHC. It’s a continuation of the rapid strengthening seen yesterday when the hurricane moved out of destabilizing air currents and into conditions ripe for a monster storm. Until yesterday, Cline said, the hurricane had been traveling through a pressure trough that generated a lot of shear — essentially, winds in the upper levels of the atmosphere traveling at different speeds than winds at lower levels. Shear is bad for hurricanes, which basically act like enormous chimneys, Cline said: They draw in huge amounts of moist air from the ocean’s surface and then vent that air out of their tops. If this chimney hits wind shear and gets knocked out of its vertical orientation, the hurricane has a tough time fueling itself, and it’s unlikely to intensify. But once Florence moved away from that trough and the relatively dry air around it, the situation changed. Without shear, the storm could stack up vertically and start hoovering up moist air. “When that happens, you have a very efficient machine,” Cline told Live Science. While we are not quite sure what this storm is going to end up doing, it is clearly not slowing down anytime soon. Hurricane Florence is very dangerous and we should all be doing what we can to prepare. Even if you do not live directly on the coast you could still feel some of the effects.